The Aboriginal Flag is manufactured by Flagworld under an exclusive licensing agreement. 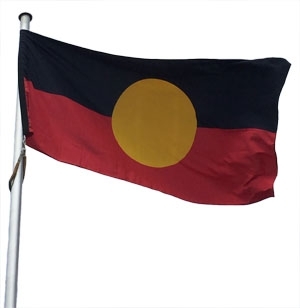 You can buy the Aboriginal flag in a range of sizes and quality materials, with the flag proudly made in Australia. The indigenous Australian flag comes in either knitted polyester which is great for indoor and low wind areas, woven polyester that is a heavier fabric and better for high wind, or as a fully sewn flag that is also made from woven polyester, but the design is sewn on rather that printed for a premium look flag.